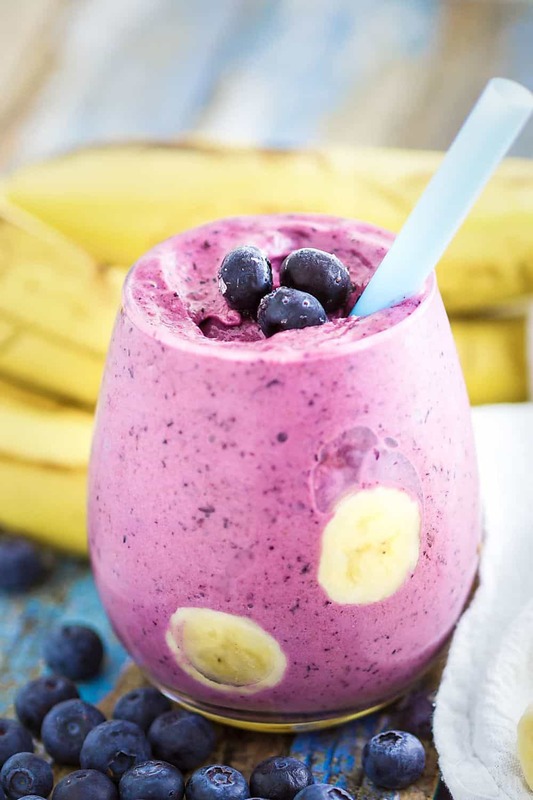 Super Thick Blueberry Banana Smoothies (Dairy Free Option) | Healthy. Delicious. Super thick blueberry banana smoothies area breeze to whip up for a morning on the go. This recipe can be made with or without dairy – pick whichever version works best for you! Despite that fact that I’ve been greeted by snow on the ground more than once this week, I’ve started making the transition from warm breakfasts like sweet potato breakfast bowls and cashew butter and jelly oatmeal cups to warm-weather treats like super thick smoothies. 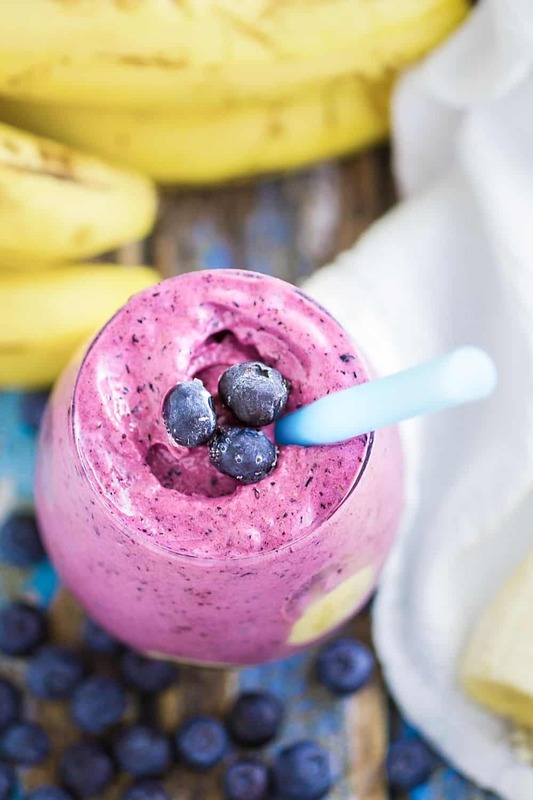 This blueberry banana smoothie is so thick that it reminds me of soft serve ice cream – any thicker and you wouldn’t be able to get it through a straw. It’s great for breakfast or as a healthy after-dinner treat. I recently saw a trick to make super thick smoothies over on minimalist baker, and I’m obsessed. Instead of adding all of the ingredients at once, Dana discovered that you can make you smoothie extra thick by processing the frozen ingredients first and adding your liquid right at the end. It makes sense – there’s less opportunity for your liquid to melt the other ingredients. And there’s nothing worse than a melted smoothie when you’re looking for one that’s thick, thick, thick. Because these smoothies are so thick, you don’t want to risk making them in a cheap blender. This job calls for a high powered machine like a vitamix or nutribullet. If you don’t have one of those, pull out your food processor for this one. Freezing your yogurt also helps make these smoothies extra thick. Just pop it into the freezer for at least an hour so it starts to firm up, and you’ll be well on your way to an ice cream-like smoothie. For a non-dairy version you could use coconut yogurt or a similar nondairy yogurt, but I feel like the brands that don’t use a lot of stabilizers or other weird ingredients are too expensive to use in a smoothie (one of these days I’ll try my hand at making my own.) Instead, I freeze coconut water in an ice cube tray and use those to help thicken the smoothie up without watering it down the way plain ice does. 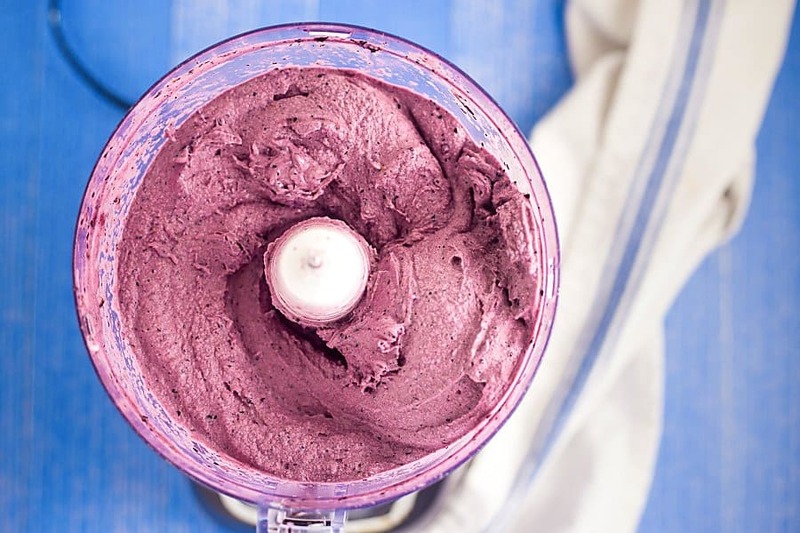 Combine the banana, blueberries, and yogurt (or ice cubes for a dairy free smoothie) in a food processor or high powered blender. Pulse several times, until the mixture looks crumbly. Add the coconut milk, vanilla, and collagen (if using) and blend until smooth. Pour into two glasses and garnish with fresh fruit, if desired. I love a thick smoothie. Blueberry and banana is the best combo! Love the tips on making super thick smoothies. Totally makes sense but never would have thought of it. This sounds like my perfect smoothie!